Vietnam signals greater regional leadership in malaria elimination by hosting health officials and experts to discuss challenges to achieving a malaria-free Asia Pacific by 2030. This week, Vietnam will host Ministry of Health officials from the Asia Pacific Malaria Elimination Network (APMEN); a group of 17 countries in Asia Pacific who each share the ultimate goal to become malaria-free. Last year at the East Asia Summit meeting in Myanmar, leaders from 18 Asia Pacific countries, including Vietnam's Prime Minister Nguyen Tan Dung, decisively committed to the goal of an Asia-Pacific free of malaria in the next 15 years. With expanded leadership and financing, both Vietnam and other Asia-Pacific nations, may reach that goal even sooner. The commitment to eliminate malaria aims to address growing concerns of resistance to the drug artemisinin - the frontline treatment for malaria. Elimination of malaria has been adopted as the only strategy that can ensure resistance does not undo decades of malaria progress. Reaching the regional malaria elimination goal will require significant investments from governments and donors, sustained political commitment, and strong collaboration among countries. On the international stage, Vietnam's Prime Minister Nguyen Tan Dung has been a role model in delivering high-level political leadership for malaria elimination, by building the support of regional leaders to an Asia-Pacific free of malaria by 2030. As co-chair of the Asia Pacific Leaders' Malaria Alliance (APLMA) with the Prime Minister of Australia, Vietnam's Prime Minister Dung has an unprecedented opportunity to bring Vietnam to the forefront of malaria elimination efforts in Asia Pacific. Dr Ben Rolfe, Executive Secretary of the APLMA Secretariat stressed Vietnam's critical leadership in the region. He stated: "The emergency of malaria drug resistance threatens the well-being and economic prosperity of Vietnam, the Greater Mekong Sub Region and much of the world. That Leaders across this region have agreed to an Asia-Pacific free of malaria by 2030 shows extraordinary vision and leadership in addressing this emergency and APMEN has a pivotal role to play in supporting elimination across the region." Since 2000, Vietnam has reduced malaria cases by 90% and reported 35,406 cases in 2013 (World Malaria Report 2014). Strong political and financial commitment from the Minister of Health, Dr Nguyen Thi Kim Tien will ensure continued success of the malaria program in Vietnam. Vietnam’s Deputy Minister of Health, Dr Nguyen Thanh Long, will officially open the APMEN annual meeting in Hoi An on Tuesday, March 24. Officials from Vietnam’s Ministry of Health, malaria experts and country program managers from the 17 APMEN countries will meet from March 25-27. The meeting will also celebrate newest country partner, India, who joined the Network earlier this month. The move by these important countries to join the network signals a significant shift towards greater commitment to elimination that will facilitate closer collaboration with their low-transmission and malaria free neighbors. Sir Richard Feachem, Director of the Global Health Group at the University of California, San Francisco, and co-chair of APMEN, underscored the necessity of regional networks in achieving elimination goals. 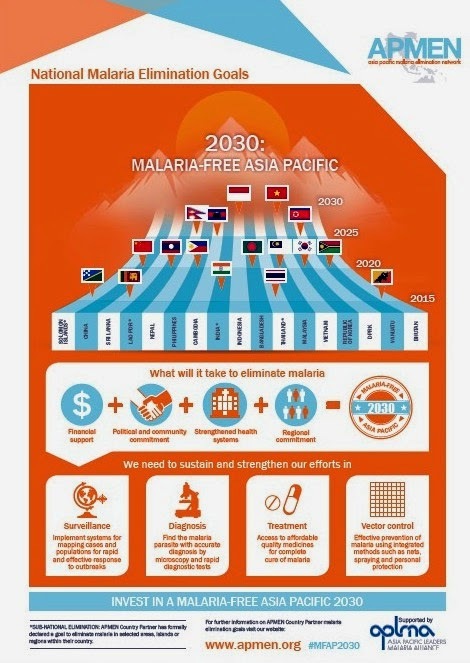 The Asia Pacific Malaria Elimination Network provides a platform for countries to share knowledge on common challenges, promote cross-border collaboration and regional political commitment to the elimination of malaria by the year 2030.